We are able to offer a complete “turnkey” service including support equipment from a PC projector and screen. Our aim is the complete success of every event and at the heart of this is our policy of ensuring the highest levels of communication with our clients. 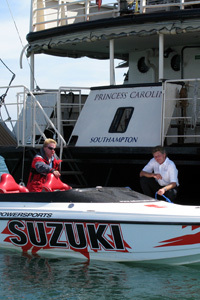 The Princess Caroline also offers tremendous facilities for Film-makers. Essentially a small ship she may be suitable as a set for some projects. Her two main decks are spacious and flexible. The upper deck has removable weather shields and is an excellent camera platform. The Princess Caroline can cater for 100 people and of course security on a boat is built in so she makes an ideal unit base. A 3 phase 160KWH generator provides clean reliable power. Crew and Masters ratings conform to UK regs and includes a Pilots Certificate to allow entry to most waters. The ship Princess Caroline is an unusual meeting point for business or pleasure. The 2 decks offer an extraordinary venue for any corporate & private event or birthday celebration. moored in Town Quay marina with easy parking,bus and city centre close by. This unusual setting is ideally placed as a meeting point for business or pleasure as we are located in the marina close to Southampton city centre within walking distance of the Isle of Wight Ferry Terminal and all other public transport routes . 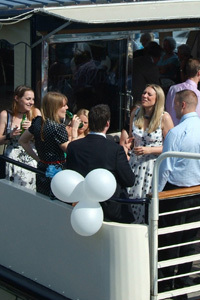 The Ship is available for event hire 7 days a week all year round with or without a cruise in local waters. If you are planning a corporate event or meeting in Southampton please contact us.